When a blood sample is added to an alkaline solution containing a non-ionic detergent, haemoglobin is converted to alkaline haematin which is a stable colour compound. The absorbance of alkaline haematin is measured using Colorimeter, Haemoglobin Meter or Clinical Chemistry Analyser.. Shelf life of one year at room temperature, for reagent and standards. 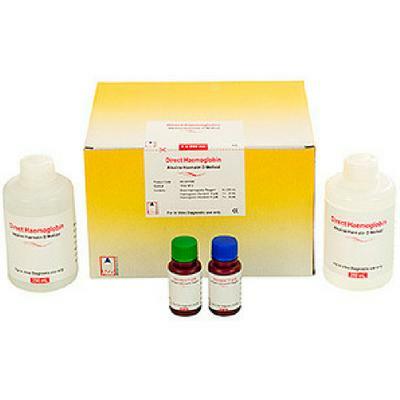 Dispense 2.0 mL of the reagent in a clean test tube and add accurately 20 μL of whole blood. Mix well and read at 578nm (540 nm – 580 nm). The colour produced is very stable.